2/10 In a nutshell: Surely one of the most inept productions ever to get a theatrical release, this Poverty Row film from bad movie giants Al Zimbalist and Jack Rabin steals its sets and props from other movies and throws science and logic out the window as it presents the first Amazons-in-space film. If you can forgive its ineptitude and fifties sexism, it’s a highly enjoyable so-bad-it’s-good movie. And there’s giant moon spiders. 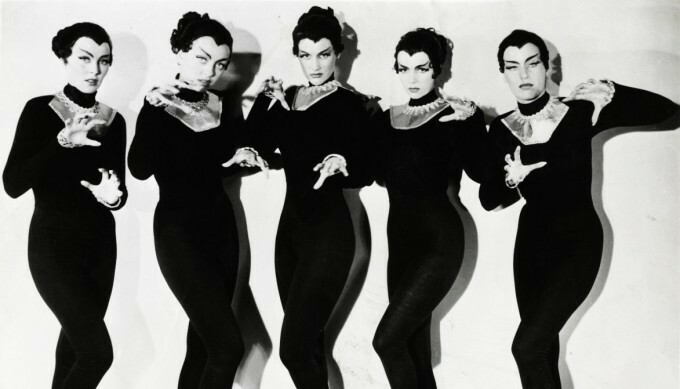 The Cat-Women of the Moon. (3/10) In a nutshell: Dynamic producer duo Pollexfen & Wisberg bring you this independet low-budget riff on Jekyll and Hyde or The Wolfman, directed by former star director E.A. Dupont. A mad scientist develops a serum which turns his cats into sabre-tooth tigers and decides to turn himself into a Neanderthal man just to prove his theory that the Neanderthal was just as smart as his descendant, homo sapiens. Decent acting and flourishes of directorial style can’t hide the low budget, bad props and make-up and a derivative script with some of the worst science in movie history. 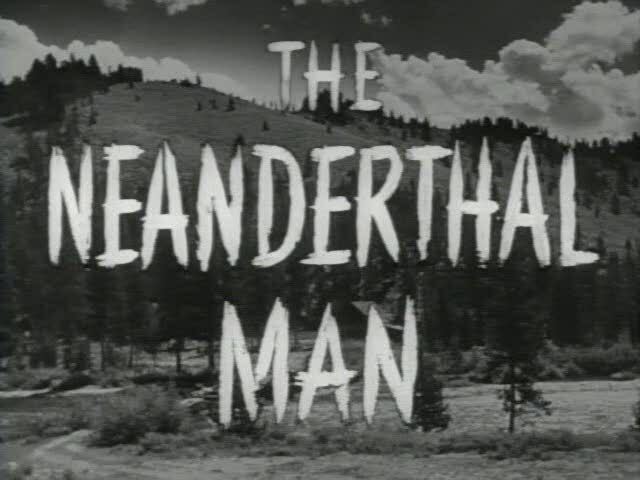 Intro credits of The Neanderthal Man, 1953. (6/10) In a nutshell: This Hugo-nominated 1953 film by William Cameron Menzies is delightfully whimsy and disturbingly surreal, balancing between pure camp and serious psychological questions about adolescence. In a dreamlike reality (or a realistic dream) 10-year old David’s parents and friends are body-snatched by Martians who have landed in his backyard. It’s a race to see if David and his confidantes can blow up the UFO before the aliens have infiltrated the whole town. 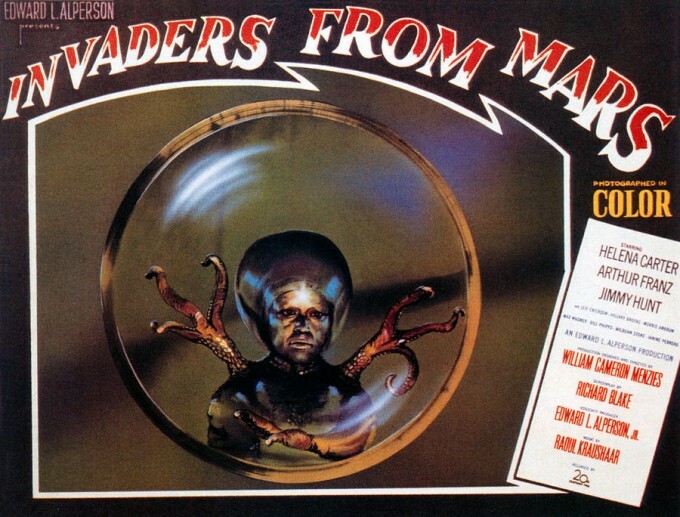 Publicity poster for Invaders from Mars, Luz Potter as “Martian Intelligence”. (5/10) In a nutshell: Often named as one of the worst movies ever made, this 1953 cult gem is actually better than its reputation, despite the super-low budget, the sloppy direction, the non-existent sets, the complete lack of logic and the truly bewildering script. It makes up for this with ambition, imagination and soul, and a huge amount of talent both in front and behind the camera. And an obese robot gorilla in a diving helmet that gets an existential crisis while trying to eliminate the last seven people on Earth with a death ray that shoots soap bubbles. Robot Monster in all his poetic beauty. (1/10) In a nutshell: One of the true bottom-feeders of the cold war propaganda films, this movie depicts five people who oppose the universal draft seeing USA invaded by the Soviet Union. Despite good talent both behind and in front of the camera, this startlingly dumb movie is singularly boring and consists to a large part of military stock footage and five people talking in a bar. Worth watching perhaps only because of Dan O’Herlihy of Robocop fame and the fact that it features two Lois Lanes. 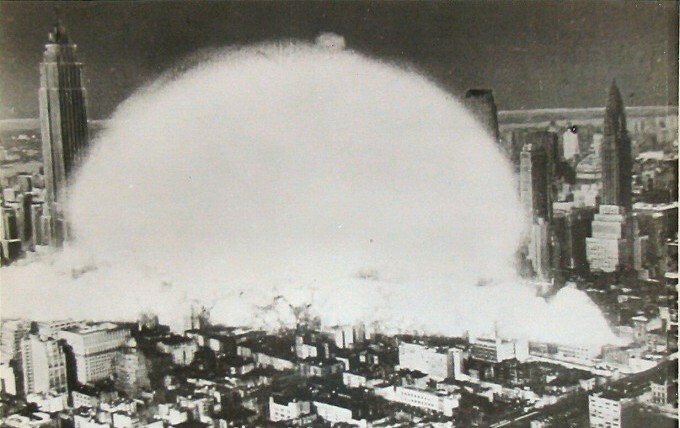 New York City getting bombed in Invasion U.S.A.
(4/10) In a nutshell: The first actual hollow Earth film made in Hollywood, this 1951 cheapo produced by visual effects wizards Jack Rabin and Irving Block is almost a good picture, but stumbles in basically all departments. Pretentious, illogical, naive, chauvinistic, shakily directed and badly acted, but it does move along at a decent pace, is filmed in stunning cave locations and has occasional glimpses of profundity and brilliance. Loosely based on Jules Verne and Edgar Rice Burroughs. Some guy (seriously, I can’t tell the apart! 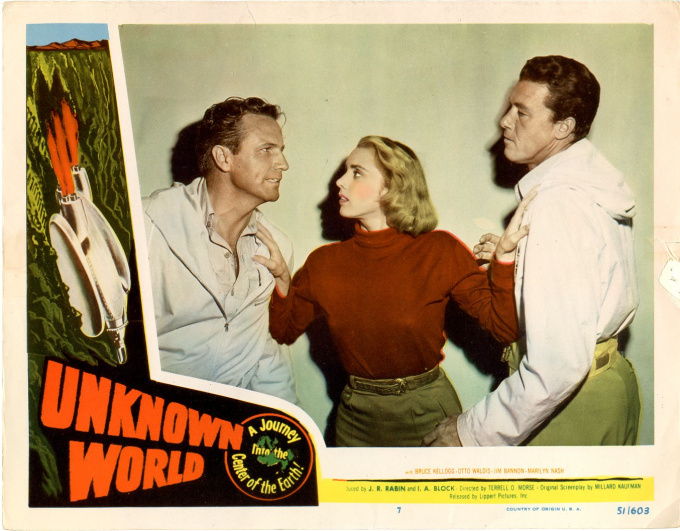 ), Marilyn Nash and Bruce Kellogg in Unknown World. (5/10) In a nutshell: Poverty Row studio Monogram jumped the bandwagon on space films in 1951 with this colour movie filmed in five days. The design and effects are not bad for a film of its budget, although much of it is scraped together from found objects, but all suspense evaporates as the space crew settles on Mars and the movie settles into a boring chamber drama with talking heads. 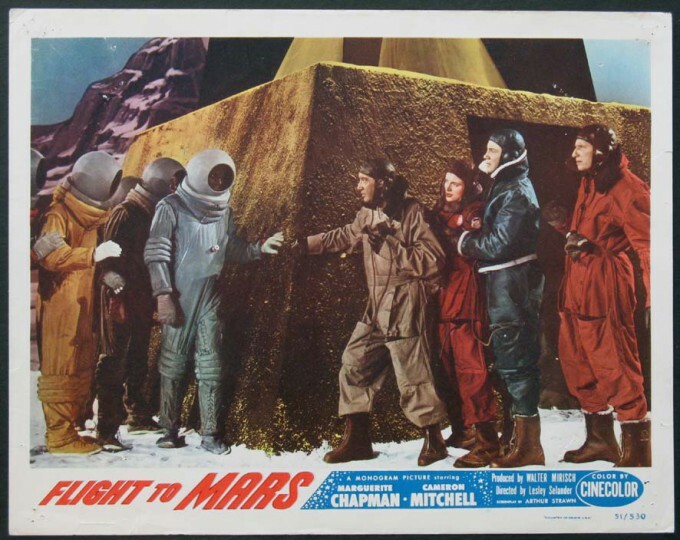 Production still and PR poster from Flight to Mars.